This could be the wedding you’ve dreamt of since you were a child, the fundraising gala that raises a fortune for your organization, or the company holiday party that gets you noticed. The crowd is excited. The food tastes great. You look amazing. The best part is that you don’t need to worry about your guests having a blast, because Goody Blue Shoes is on the stage! Believe it or not, your choice for event entertainment is the most important decision you’ll make. People may not recall what they ate or the color of the flowers, but they will always remember an amazing band and an energetic emcee that effortlessly keeps the crowd engaged. Your choice is about so much more than just the music! From your first call to us right through to the end of your big day, Goody Blues Shoes has the experience, know how, and flexibility to make the event seamless for you and the party of a lifetime for your guests! Expert Planning – Communication and organization are of the upmost importance when working with your event music partner. GBS’s Event Coordinator, John LaPalomento, will be by your side as consultant from day one, on stage as your Master of Ceremonies on your event day, and everywhere in between. John has been helping clients plan their dream events for years, and has the experience it takes to make your dreams come true. You can lean on John for tasteful suggestions when you aren’t quite sure what you want, and he’s only a phone call or email away as the big day gets closer. 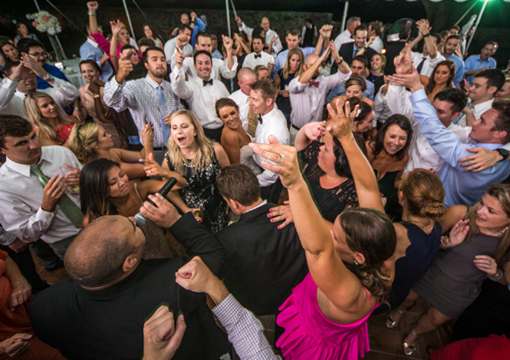 Complete Customization – From classy elegance to throw-your-hands-in-the-air fun, GBS will set the mood that you want for your wedding or event. You hold the keys to your big day, and our expert consultation will help unlock the best. Amazing Flexibility – No matter how much planning you put into your event, variables happen! That’s why it’s so important to have a Master of Ceremonies and performers that have the flexibility it takes to run a smooth event. When the caterer is running 15 minutes behind for dinner service, or the best man is nowhere to be found for his toast, GBS has the experience and know-how to work around any delay or behind-the-scenes issue. You and your guests won’t even know anything was ever out of place. 100% Live Music – It may sound crazy, but many of the top bands are playing against prerecorded backing tracks. GBS delivers only top entertainers performing 100% live music. Really talented musicians make really amazing music – all the time. Non-Stop Music – GBS proudly features mega-medleys of today’s hits and timeless classics for non-stop entertainment. Once the dancing starts, there’s no stopping! While other bands are playing 15 songs in an hour, you’ll hear over 25 from GBS! Amazing Value – Simply put, GBS delivers the very best value for live event music – hands down. While other similar bands are charging $8,000 to $12,000 or more, you’ll be surprised at how affordable your dream wedding or event can be with GBS.